Spokane City Attorney Michael Ormsby's apppointment caused River Park Square issues to again rise to the surface. City Council President Ben Stuckart is frustrated with the River Park Square scandal. Not the messy public-private partnership a decade ago that cost the city millions of dollars, but the ongoing reaction to the scandal. The subject came up during Monday night's narrow 4-3 vote to confirm former U.S. Attorney Michael Ormsby as Spokane's new city attorney. Several speakers — including Councilman Breean Beggs — brought up concerns about Ormsby's controversial role in the scandal, resulting in Stuckart delivering an impassioned monologue decrying "the anger that holds us back as a community to continue to re-litigating the thing over and over and over, by the same angry small group of citizens." "I just — I hate that we keep litigating River Park Square over and over and over in our community," Stuckart says. For a quick Cliff Notes overview of the River Park Square scandal, check out our coverage of the incident from last year's Scandal! issue. Here's the even quicker version: In the mid-'90s, Nordstrom was threatening to leave, potentially dealing a death blow to the retail market in downtown Spokane. In order to save Nordstrom, the Cowles family — publishers of the Spokesman-Review, real estate tycoons and among the city's wealthiest families — offered to revitalize River Park Square, turning it into a swanky, modern shopping mall, complete with a parking garage. That's where the city got entangled. As part of a public-private partnership, the city borrowed Department of Housing and Urban Development money and sold bonds to get the facility built. The catch: If the parking bond failed to bring in enough revenue, the city would be on the hook to make up the difference. But it turned out that the estimates for the garage were wildly — some claimed fraudulently — optimistic. The city, furious, defaulted on its loans and spent years tangled in lawsuits involving the garage. It arguably cost three — count 'em, three — mayors their jobs. Ultimately, Stuckart says it left the city paying $2 million a year, with half that amount because the city defaulted on its loans. Monday night, Stuckart underscored how much of a mistake that was. "Think about for the last 17 years, if we would have been able to have control of that garage as an asset, and had been receiving all that parking revenue?" Stuckart says. "That's $17 million!" Stuckart, who was 25 when the scandal began, further argued that despite the cost, the city was in a much better position for the deal. "But for River Park Square, we wouldn't have the Davenport, the Fox, the Davenport Grand, the new shops downtown. We wouldn't have the investment in Riverfront Park. Even if it did cost the citizens some money — and we pay $1 million a year — it was worth the investment." Stuckart highlights the danger of continuing "to focus on the public-private partnership and the errors that were made on gambling on how much money was going to come in from that revenue, and don't start looking at what the actual problems are." This isn't the first time that Stuckart has brought up his frustrations over the psychic toll the River Park Square scandal has taken on the city. In 2014, discussing using HUD financing to help the ailing Ridpath Hotel, he told the Inlander that he'd been warned that "there is so much history that nobody even wanted to go near it, or talk about those again." "I can see why people are wary," Stuckart added then, "but I think we've come far enough as a community that if we have tools ... that can help move projects forward, we need to be examining those." But for Beggs, River Park Square's legacy held more value as a cautionary tale. He once served as an attorney for the Center for Justice, which won a $300,000 public records settlement against the city of Spokane. The issue? The city's attorney office repeatedly invoked attorney-client privilege to prevent reporters from obtaining documents that exposed the River Park Square deal, and how much the city council knew about it. The issue with the city attorney's office trying to stop the public from getting information was one reason that Beggs has pushed for an independent city attorney who can't be fired by the mayor. "The Center for Justice was deeply embroiled in the River Park Square situation; that still haunts us today when we do budgets, and we have to figure out that $5 million in bond payments, which are going to have go on for a while," Beggs said in his comments to the city council. Ormsby was a major part of the River Park Square mess. When he was with Preston, Gates & Ellis, he represented the Spokane Downtown Foundation, a nonprofit set up by the Cowles family to sell River Park Square bonds. He even sent a letter to Sen. Patty Murray in 1997, discouraging her from intervening to stop or slow the River Park Square deal. In all the messy fallout from the River Park Square disaster, Orsmby and the Foundation became one of many subplots. The Internal Revenue Service looked into the Foundation, concluding that not only did the Foundation not qualify as a 501(c)(3), the bonds did not qualify for tax-exempt status. It's a serious critique of the decisions made by the Foundation. "I did spend some time last week rereading the IRS report on the bonds, and all the problems and the secrecy. Just a very sad chapter in Spokane's history, having to do with public-private partnerships," Beggs said Monday. "It's the kind of issue I still fear in the city, and especially, [because] we don't have an independent city attorney's office." The IRS report is scathing: 'The bond issue from the start was clearly for the substantial private benefit of the developer, to the detriment of the public. The direct result of the payment, the concealment... and the certification by the developer on the purchase agreement directly and unjustly enriched the developer with $10 million or more of the Issuer/Foundation assets." Ultimately, the IRS Office of Professional Responsibility, which examined issues of whether Ormsby had failed to conduct proper due diligence, settled with Ormsby and a fellow lawyer, agreeing to extra processes, layers of review and oversight. No admissions of wrongdoing were made as part of the settlement. Federal investigators never found any evidence of fraud associated with the garage, but the issue continued to dog Ormsby. When President Obama appointed Ormsby in 2010 to be U.S. Attorney for Eastern Washington, critics of his River Park Square role, including former Mayor John Talbott, pointed to Ormsby's role in the River Park Square scandal as a reason why Ormsby shouldn't be considered for the post. 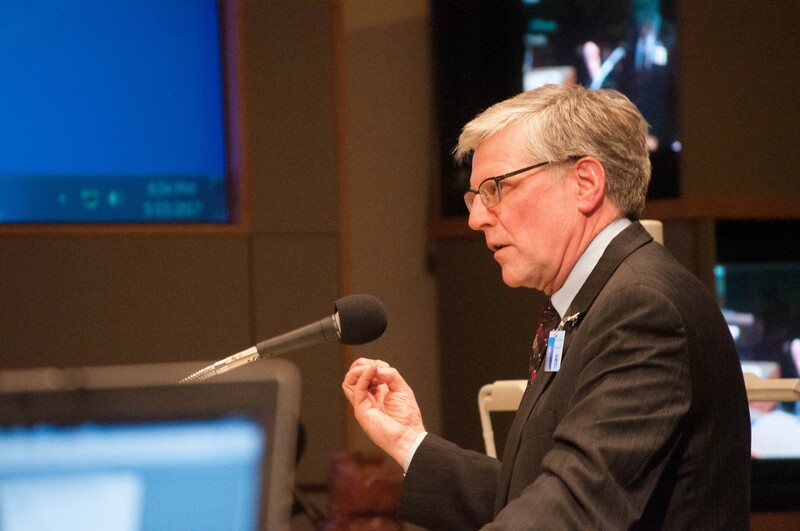 Monday night, the River Park Square issue was again raised against Ormsby. But it was also met with several waves of praise from other attorneys and public officials regarding his record as U.S. Attorney. "I trust the judges, the courts, that litigated things. I trust the judges and the courts that looked into issues," Stuckart noted. "And Mike [Ormsby] was not held liable for any of these issues with River Park Square." Here are Stuckart's full comments on River Park Square from Monday night. I just — I hate that we keep litigating River Park Square over and over and over in our community. Because, we never talk about why we are paying $2 million a year. $1 million of that is because of the community anger at the time, pressured the mayor and the council at the time to default on the to default on the bond payments, which meant we lost control of all of the revenue! Think about for the last 17 years, if we would have been able to have control of that garage as an asset and had been recieving all that parking revenue? That's $17 million! But [there is] the anger that holds us back as a community to continue to re-litigating the thing over and over and over, by the same angry small group of citizens. And if we continue to focus on the public-private partnership and the errors that were made on gambling on how much money was going to come in from that revenue, and don't start looking at what the actual problems are? Because $17 million over the last 17 years would have been a huge benefit for our community. And we never use the 'but-for test.' Which is a logic test. But for RiverPark Square, we wouldn't have the Davenport, the Fox, the Davenport Grand, the new shops downtown. We wouldn't have the investment in Riverfront Park. Even if it did cost the citizens some money — and we pay $1 million a year — it was worth the investment. Because just think about what is being invested in our town right now. And if we continue to re-litigate this every time we make a decision over the next 10 years, we're never going to move forward as a community. I trust the judges, the courts, that litigated things. I trust the judges and the courts that looked into issues. And Mike [Ormsby] was not held liable for any of these issues with River Park Square.